One could argue it all started in 1957. Why? Well, that was the year Russia put Sputnik into space. The Americans, under the leadership of President Dwight D. Eisenhower and John F. Kennedy, were forced to step up in order to retain their status as a leader in technology. That period of innovation drove the birth of NASA and the world saw the value of a focus in Science, Technology, Engineering and Math (STEM). And what did that then lead to? In the next few decades, the internet was invented and a company called Apple released the Macintosh and the iPhone. Today - not only does the electric car exist, but there is a Tesla in space! But is STEM something that works for you? Here’s three good reasons why. What does it mean to have a STEM education then? It means that instead of being taught each of the subjects (Science, Tech, Engineering and Maths) separately, your curriculum would mix them up and have them applied to real-life situations. This means you won’t just be laboring over Trigonometry - you’ll be taught to understand how it correlates (or doesn’t!) to Quantum Mechanics and renewable energy. You’ll be encouraged to fail and fail hard so that you will learn from it, and you won’t just be assessed by rigid standardised tests - you’ll also get to produce and create! STEM employment grew 3 times faster than non-STEM employment between 2010-2012. The skills gap in the manufacturing sector is significant. It faces a big shortage of skilled employees – nearly 600,000. According to the American Engineering Association, STEM graduates earn 87% more than the average salary of a non-STEM graduate. For example, the average starting salary for mechanical engineering graduates is $58,392 and computer scientists start, on average, at $61,205. It’s been said that men outnumber women significantly in STEM careers, but a wind of change is coming and the industries are actively trying to change that. Today, schools and companies are reaching out more to women to balance the gender gap and encourage diversity. They’re starting to see that the ‘tech bros’ who claim women don’t belong in STEM fields are wrong - in fact it’s unacceptable and unsustainable. Having a balanced perspective will only guide the direction of scientific inquiry and product design even more. Here’s the good news: according to the National Science Foundation statistics, in the last two decades in America, the only fields in which men greatly outnumber women are computer science and engineering. 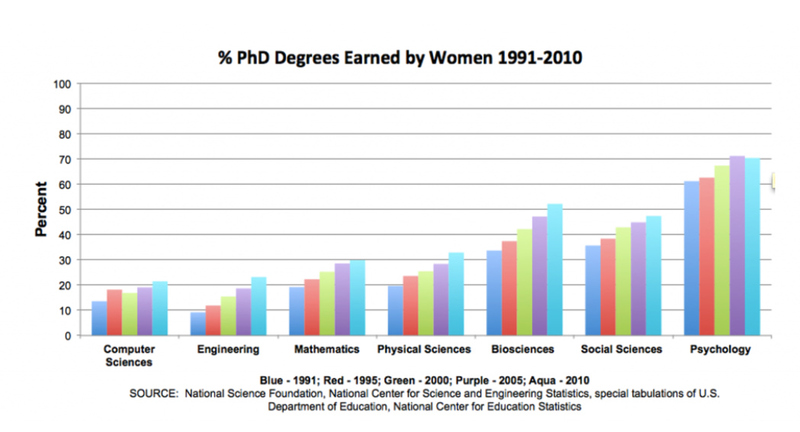 In fact, women already greatly outnumber men in the field of Psychology (with 78% representation). But What Does STEM Actually Look Like in Schools? The first thing to know is that no two STEM courses are alike, and that is the beauty of it. You can choose from the wide ranging courses available to fit your specific needs. One one end, there are course-specific classes. These could be something you sign up for before university. You might have even already join a computer science pathway in high school, which is popular today. Other pathways in demand include Engineering and Bioscience. Some Universities offer STEM programs within different schools, with degrees that apply the STEM principles in their curriculum. Others have built the entire school built around STEM, so that all the programs are designed to push innovative minds to their full potential. Whether you’re looking for a foundation course, a degree program or to find a school specialising in STEM - there is definitely a place that will suit you, somewhere in the world. Interested? Browse these opportunities for STEM programs to find the one that fits you, and you might just win scholarships, cash prizes and more!